First looking at the figures, then hearing out the organization. When Susan Duinhoven was given the mission of getting Sanoma through its crisis, she began with her usual method: first looking at the figures, then hearing out the organization.“After interviewing a hundred employees, you know all there is to know”, the CEO explains. It is 7.30 on a Thursday morning, and the short stretch of Ludviginkatu street in the center of Helsinki is deserted. The wind rustles through some litter on the pavement, and the staff of restaurant Grotesk on the corner of the street have not turned up to work yet. Grotesk was named after the letter font as a tribute to the history of its location; it is housed in the former premises of Finland’s biggest daily newspaper Helsingin Sanomat. The newspaper’s predecessor, Päivälehti, was founded to promote the cause of liberal Fennomans in 1889, at a time when Finland was still part of Russia. For decades, the rumble of printing machines echoed from the cellars, while youngsters stood at the street corners ready for their newspaper round. The street lived and breathed events in Finland and the rest of the world. Over the years, the newspaper began to turn into a media empire, with newspapers, radio stations, television channels, magazines, and publishing activities in several different countries. At present, approximately half (EUR 830 million in 2015) of Sanoma’s EUR 1.7 billion turnover derives from magazine and television operations in the Netherlands and Belgium. Finland’s Sanoma Media (EUR 573 million) is the second key market, while with its focus on learning materials, smaller Sanoma Learning forms the third main area (turnover of EUR 281 million). Today, in addition to Restaurant Grotesk, only Päivälehti Museum, a media museum run by Helsingin Sanomat Foundation, serves as a reminder of Sanoma company’s past along Ludviginkatu street. Former Helsingin Sanomat premises are now home to new companies: a PR firm, and a real estate company that rents out office spaces. A tall and slender silhouette crosses the street in the distance – Sanoma’s Dutch CEO Susan Duinhoven (b. 1965). “It’s a luxury to be able to walk to work,” says Duinhoven, who lives nearby. We have agreed to walk together to her workplace Sanomatalo, an imposing glass building close to Helsinki’s main railway station. Sanoma commissioned the glass construction during the height of its reign in the late 1990s, when the media empire was in dire need of larger, more modern facilities. Sanomatalo building serves as a hub for daily newspaper Helsingin Sanomat, tabloid paper Ilta-Sanomat, and online financial publication Taloussanomat, as well as houses Nelonen Media broadcasting group, Sanoma Digital consumer media company, and Sanoma’s commercial operations and headquarters. As a media company, Sanoma has enjoyed an exceptionally strong status in Finland. Similarly to other Nordic countries, Finns are eager subscribers to newspapers, and even in these digital times, the newspapers’ own websites are by far the most popular way to stay up-to-date with the news. The situation in Finland is in contrast e.g. with the U.S., where people mainly read news via social media. Sanoma’s publications are meant for everyone. Susan Duinhoven took to the helm of Sanoma in October 2015, after CEO Harri-Pekka Kaukonen was asked to step down. Duinhoven was invited to join the Board of Directors in early 2015, after giving up her position at Dutch media company Wegener, which had been sold. Duinhoven joined the board a few months down the line. She was surprised to discover how rapidly profitability had taken a turn for the worse. “It was clearly going downhill. It did come as a bit of a surprise to me, but the challenges (?) were familiar.” Duinhoven refrains from analyzing Sanoma’s past, as management’s strategic decisions always depend on each situation at hand. But she does go on to say that, due to its strong market position, Sanoma has survived longer than other media companies by selling off chunks of its balance sheet, such as kiosks in Latvia and book printing operations The list of divestments, or sold assets, in recent years is long. “In other media markets with tougher competition, companies were hit sooner and harder. The world has changed a great deal. Fifteen years ago there was no Google,” Duinhoven explains, mentioning the Dutch media market as an example of tough competition. Taking the lead of a company on a moment like this means a lot is expected of Duinhoven. This is nothing unusual as such; media companies throughout the world are in demand of change leaders. Sanoma, too, seems ripe for change. Duinhoven is a classic example of a contemporary director of a media company. . Neither gentle or high-handed mother and father figures, these are transformers all set to shaking things up, with tricks up their sleeves from the venture capital world. Saving a company takes resilience, sharp insight, and execution skills. You need to be able to divest, eliminate, and overlook some of the grumbling of employees. It is also important to be able to provide inspiration and boost innovation. Both Duinhoven and her predecessor Harri-Pekka Kaukonen have a background with global, top-ranked consulting firm McKinsey. Traditionally, media companies have been family-owned businesses, with owners patient enough to see their firms even through tough times. For a long time, media publishing has been seen as something unique, as it comes with the notions of freedom of speech, the Fourth Estate, and guarding democracy. But things are different now. In the case of Sanoma, the grip of family Erkko has loosened, and the company now has the identity of a purebred publicly listed company. Susan Duinhoven is a fast mover and fast talker, but despite chatting away, her every word counts. She is quick, direct, and clearly happy to answer in the first place. So, how does a change leader begin to outline the strategy? “I always follow the same method. I start with the data. Numbers need to be examined thoroughly in order to understand why the company is in difficulty. They also reveal what needs to be held onto during the change process,” Duinhoven begins. For the purpose of this interview, we are sitting in a small meeting room on Sanomatalo’s second floor. “Typically, people will say: “Oh, this is really important to us”. Then I take a look… yeeesss… it has certainly been invested in, but doesn’t seem so relevant for the company any longer.” Times change, and sometimes companies fail to keep pace. When that happens, movers and shakers are brought in from the outside – like Duinhoven. After cracking the numbers, Duinhoven moves on to interviewing her immediate subordinates and employees reporting to them, which takes about 4-6 weeks. Usually, she conducts 100-120 interviews depending on the size of the company. After the round of interviews, Duinhoven spends a couple of weeks fine-tuning the strategy. At this stage, she blocks her ears from others to keep her views crystal clear. Duinhoven is renowned as an analytical, determined, and tough implementer. Before her current position, she and her team prepared the Dutch Wegener media company for sale. This was the case also at Sanoma. She was first seen as tough, everyone knowing for sure the same old patterns could not continue. At the same time, everyone was aware it would take more than some minor adjustments. The CEO listening to her employees and seeming to know what she was doing made people feel safe. Duinhoven does not seem preoccupied with her image, nor needs to soften edges. She is not as interested in reputation as she is with doing her job as well as possible. This self-reliant personality does not worry about what others think on the whole. When asked about her hobbies, she mentions reading, although: “I really don’t go for anything highbrow - John Grisham, Lee Child, and biographies.” Her statement is unconventional to say the least in an industry characterized by a dose of cultural snobbery. Media companies are textbook examples of firms operating within structures shaped by an outdated business model. The old business model waning without knowledge of a new one adds its extra spin to the shift that is taking place. The former earnings logic based on advertising sales and subscription fees, which in the height of its day was more or less a moneymaking machine, simply no longer works. Something has to be done. Duinhoven faces plenty of challenges, with dramatic changes taking place in the ad market this year that has also seen Finnish advertising funds quickly disappearing into the pockets of Facebook and Google. “The hybrid stage is definitely the toughest. And right now we’re in the middle of it,” Duinhoven sniggers. What she means is that print media continues to prevail, while at the same time media companies need to put all their energy into digital media, which is where the growth is. This is the case despite revenue from the digital side being nowhere enough to compensate lost income from printed media. There are signs, however, that the digital revenue is beginning to gather pace. “Two, three years is a long time in this industry. Thinking ahead too far is a waste of time, as no one knows what the future brings. Already drafting next year’s budget is a challenge, as the industry changes so fast. We need to monitor our customers, and we are highly dependent on outside trends.” The importance of customers is one thing Duinhoven is sure about. She wants to understand the fickleness of customers – which include both media content consumers and advertisers - as well as possible. Everything else is uncertain, which suits Duinhoven just fine: “The plan may be clear, but it needs to be revamped every three months.” Uncertainty also creates possibilities and Duinhoven certainly sees media as a successful business of the future. Duinhoven has a sip of water, and gets visibly excited when she begins to talk about mistakes every leader makes, including herself. According to Duinhoven, change processes cannot and should not be democratic. Duinhoven does understand the media’s change resistance, as the industry is so dependent on processes. When changes needed to be communicated at Wegener, Duinhoven suggested that the company’s business journalists interview management. “I try to communicate to the organization that creativity needed in product development can also be applied to the company’s processes. It’s not like there is a nice product development section, and less appealing cost section. They are one and the same.” In a media company, product development usually involves new digital products, while cost areas are often seen as the production of traditional newspapers and related resources. Fruits of Duinhoven’s strategy were already reaped last summer: since early October 2015, shares had gone up by 146 per cent by mid-August 2016. Just to compare: during the same period, the OMX Helsinki Index was up by 8.5 per cent. The improvement in the July interim report results came as a positive surprise to investors. Just a year before, the ugly profit warning meant Sanoma had tumbled into a crisis. Duinhoven bursts into laughter, as she recollects the stunned look on the analysts’ faces when the results were announced and she mentioned investments. Typically for a business going through tough times, the prevailing trend in media has been to cut, divest and save. No wonder analysts where not prepared to hear about investments. “Investments have been part of the plan all along,” she remarks. Media companies undergoing strategy renewal have typically been chopped up. British Pearson is a recent example, which sold off its crown jewels Financial Times and The Economist. In 2017, Pearson may well be doing away with publishing company Penguin Random House, leaving only learning materials behind. Sanoma, too, has its learning material department. Sanoma Learning, Sanoma Finland, and Sanoma Benelux do not share much in common. “The search for synergies was in fact more expensive than the synergies that were found,” the CEO says. These thoughts are likely to cheer up many at Sanoma, who have tried in vain to detect synergies, as it is the done thing these days. Duinhoven’s open, straightforward reflections are a breath of fresh air compared to what we so often hear from directors. In her words, she is “direct Dutch”. Duinhoven was recruited by Sanoma’s chair Antti Herlin, whom she praises for being a “direct communicator”. In her opinion, Finns on the whole “say what they mean, and do what they say.” Currently, Antti Herlin is the largest shareholder of Finland’s most prominent company Kone, and occupies the top spot in the Finnish business world. Duinhoven thrives in the Finnish corporate culture, which, similarly to the corporate culture in her native country, is, genuine, straightforward, and low on hierarchy. It would be hard to imagine her in a very elaborate culture. Half of the turnover of the company she leads originates from a product with its core in the Finnish language. Our chat on a Thursday morning is nearing its end. By now, the summer sun glistens high up in the sky, and the building has gradually filled up with people. It is time for Duinhoven to change-manage her employees, despite the future being unclear. She begins her ascent up the stairs to the top floors of the building without glancing behind. There is no way back to the shining past along Ludviginkatu street. Here, the company’s struggle in the hands of a media crisis is evident in editorial staff now occupying two floors instead of three. The future of media and Sanoma may be unclear, but it suits Duinhoven just fine. 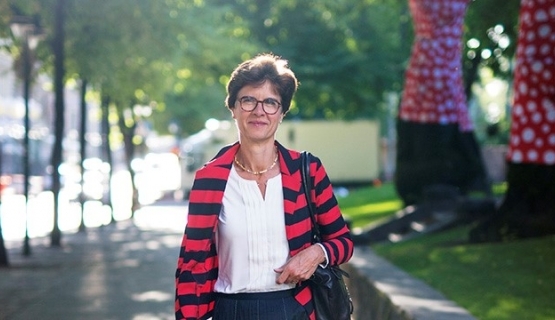 At the helm of a Finnish publicly listed company, Susan Duinhoven from the Netherlands is doubly rare: a woman and a foreigner. The vast majority of directors of Finnish listed companies are male, which is a typical feature in small countries. “The same is true in the Netherlands,” Duinhoven states. According to an EU Commission report, only 5.1 per cent of directors of the largest publicly listed companies are women (April 2016). The EU statistics for Finnish companies amount to zero, as the statistics only include the largest publicly listed European companies. In summer 2016, in addition to Duinhoven, four Finnish listed companies had female managing directors, but the companies are too small to be included in the EU statistics. Outside the European Union, the share of women directors is just as modest; 4.4 per cent of S&P 500 company directors in the U.S. are women (summer 2016), perhaps most famously Mary T. Barra from General Motors, while 5.5 per cent of London stock exchange FTSE 100 company directors are women. Commensurate information from different countries is hard to attain, as companies have been included in the statistics on slightly differing grounds, and in part the figures apply to different time periods. The boards of publicly listed companies demonstrate a slightly higher proportion of women than in the case of top management. Board membership is indeed one path to becoming a managing director. 23.3 per cent of the board members of the largest publicly listed companies in the EU are women (April 2016). Finland Chamber of Commerce estimates that the share of women in the boards of Finland’s largest listed companies will rise to 32 per cent this year. In other words, the glass ceiling has been broken, but has not yet been completely shattered. In addition to the glass ceiling, the glass cliff is another term commonly used when discussing equality. Studies carried out at the University of Exeter in the early 2000s discovered that women are more likely to be appointed as directors in companies that are struggling or facing a crisis – in other words, where the director is less likely to succeed. The term was coined by professors Michelle Ryan and Alex Haslam of University of Exeter, United Kingdom. The phenomenon also applies to politics, such as when conservative Theresa May became Prime Minister of the United Kingdom following the Brexit vote. Female directors are more likely to hail from out- side the company compared to their male counter- parts. They are also prone to harsher criticism, another feature of the glass cliff. The phenomenon has been explained by companies facing a crisis having a type of mandate to appoint a woman director, which in itself is a signal for change as opposed to the standard option, a man. In Japan, crisis companies are more likely to appoint a foreigner as director, albeit male. Of course this is an alternative – but a short-lived one. The failed “alternative” crisis manager is usually followed by a male director from the home country. As a result, men are appointed as directors more fre- quently when a company is on an upswing. After the “alternative director” has failed, the situation stabilizes once again in the hands of a man. This in turn hampers the escalation of women as directors, and once again nearly half of the population receives a blind eye as the next bright star is being sought. Susan Duinhoven’s career began in the lab of Dutch conglomerate Unilever, where she worked on her PhD in chemistry. Chemistry was her subject of choice because she wanted to study “something difficult and complex”. “I was interested in natural sciences, and chemistry covers a whole range from mathematics to medical applications. I ended up delving into the more mathematical end of the spectrum – theoretical and physical chemistry.” From the lab, Duinhoven moved internally to the business side. After six years at Unilever, Duinhoven was approached by McKinsey. She considers her experience in consulting as the first major turning point in her career. Becoming an owner was the second turning point in Duinhoven’s career; together with partners, she acquired the Dutch Yellow Pages business from Dutch Telecom. After the acquisition in the middle of the month, she describes the enthusiasm, excitement, and responsibility involved in having to gather enough revenue to pay the salaries of 600 employees by the end of the same month. Duinhoven has also been managing director at Yellow Pages in Denmark, Thomas Cook West Europe in Denmark, and Reader’s Digest in the Netherlands. She joined Sanoma after being CEO of Wegener publishing company. When asked about power, Duinhoven ponders for a moment. She sure has it, as CEOs always do. “I love jigsaw puzzles, and this is a giant one. I have always looked for harder and harder puzzles to solve,” Duinhoven states when asked about Sanoma, which has a turnover of approximately EUR 1.7 billion. Her career choices have been determined by the level of challenge and interest. “The field has to be relevant in some way, and Sanoma fits into that box,” the CEO describes. Duinhoven lives by herself, and spends about 90 per cent of her time in Finland. She also has a house in the Netherlands, visiting her home country every couple of weeks. Splitting her time between two countries is nothing new to her, but something she has done for a long time. Duinhoven has had a taste of Finnish life for instance by learning to cross-country ski in Paloheinä, Helsinki. Learning the ropes of M&AsFor business leaders, the attractiveness of mergers and acquisitions, M&A, appear to ebb and flow in the tide of economic growth and decline.